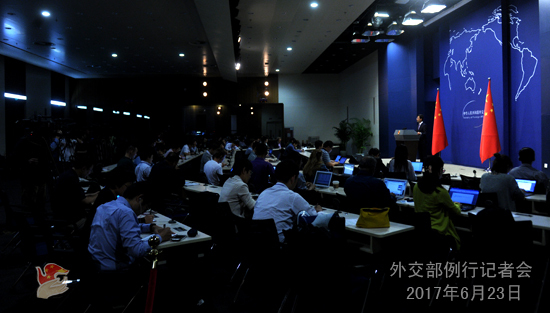 From June 29 to July 1, the 15th East Asia Forum will be held in Changsha, Hunan Province. Government officials, representatives from the industrial sector, academy and the ASEAN Secretariat will hold in-depth discussions under the theme of "20th Anniversary of 10+3 Cooperation: Moving Towards East Asia Economic Community". During the Forum, a concert to commemorate the 20th anniversary of 10+3 cooperation will be held. Foreign Minister Liu Zhenmin will head the Chinese delegation to attend the Forum. Q: According to the announcement you made just now, this year marks the 20th anniversary of 10+3 cooperation. How does China view the 10+3 cooperation mechanism? What are China's expectations for taking part in 10+3 cooperation in the future? A: 10+3 is the main channel for East Asian cooperation and the main vehicle for the building of the East Asia Economic Community. In 1997, while countering the Asian financial crisis, the East Asian countries initiated 10+3 cooperation process. 20 years on, 10+3 cooperation, having stood the test of two financial crises, has become one of those cooperation platforms with the most well-established mechanism and most notable outcomes. 10+3 cooperation has delivered tangible benefits to the peoples of the region and played an important role in promoting the regional cooperation in East Asia and empowering East Asia to become the engine of global growth. Against the backdrop of anti-globalization and the regional integration process facing challenges, deepening 10+3 cooperation is highly relevant. Attaching great importance to 10+3 cooperation, the Chinese side has always been very supportive and taken an active part in it. The Chinese leaders attended all the 10+3 Leaders' Meetings previously and put forward a host of major initiatives such as building Free Trade Area, enhancing connectivity and conducting poverty alleviation cooperation in East Asia during these meetings. The Chinese side has taken an active part in the Ministerial Meetings, Senior Officials' Meetings and Ambassadorial Meetings in various areas under the 10+3 framework and undertaken a series of pragmatic cooperation projects. China is one of the most active 10+3 countries that has undertaken the largest number of projects. China hopes to take the opportunity of the 20th anniversary of 10+3 cooperation to work with all relevant parties to increase input, deepen cooperation in such key areas as finance, agriculture and poverty alleviation and foster new growth points in production capacity, media, tourism and other fields, thus promoting the building of the East Asia Economic Community and opening up a new chapter in East Asian cooperation. Q: US officials said that on Wednesday the DPRK launched another test on rocket engine, which is thought to be possibly used for test on new missile. Can China confirm this information and what are the comments of China? A: The DPRK-related resolutions of the United Nations Security Council unequivocally stipulate that the DPRK is banned from conducting the launching activities using ballistic missile technology. 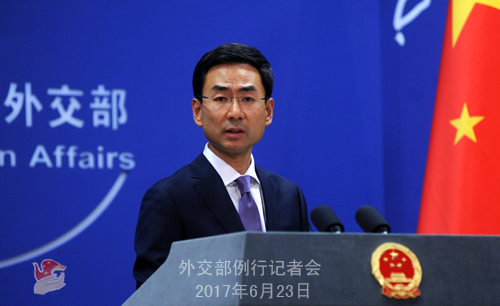 China opposes any action that breaches these resolutions of the United Nations Security Council. In addition, currently, the situation on the Korean Peninsula is still complex and delicate. We hope that relevant parties can exercise restraint and refrain from taking actions that might further escalate the tensions on the Korean Peninsula. Q: French President Macron said that he wants the EU to have more powers to control Chinese investments in Europe, especially in key industries. Does China think this is protectionist attitude? A: I have noted relevant reports. Under the background of the rise of anti-globalization, many countries in the world, including the European Union (EU) countries have kept stressing that all forms of protectionism should be opposed. Recently, the EU has made a series of positive statements on China-EU economic cooperation and trade. The Chinese side encourages Chinese enterprises to invest and start business in EU countries and requires them to observe local laws and regulations. Meanwhile, we also hope that the EU countries can provide a fair and just environment for Chinese enterprises to invest and start business there. Q: On 22 and 23 of June, the Nuclear Suppliers Group (NSG) is holding its plenary session in Bern, Switzerland. One of the issues that the NSG is going to take up is new membership to the Group, specifically India's pending application which was also discussed at last year's session. Do you have any updates on the NSG meeting? Is there any change to China's view in terms of whether the Group is closer now to agreeing a set of criteria to allow new members in? A: The plenary session of the Nuclear Suppliers Group (NSG) will be held in in Bern, Switzerland. China will send its delegation to attend the session. With regard to the application of the non-contracting parties of the Non-proliferation Treaty (NPT) to join the NSG, I can tell you explicitly that China's position has not changed. I would like to point out that the NSG has clear-cut regulations on the enlargement of its membership. The plenary session of the NSG held in Seoul issued clear-cut mandate on how to deal with relevant issues. Therefore, all relevant parties should observe the regulations and mandate. Regarding the criteria on admitting new members you mentioned just now, the Chinese side supports the NSG in continuing to discuss the technical, legal and political issues concerning the admission of the non-contracting parties of the NPT into the NSG based on the mandate of the plenary session held in Seoul in 2016 and the principle of consensus-building. As for the results of the discussion, I cannot make prejudgments now. Q: According to media reports, DPRK's ambassador to India Kye Chun-yong said when giving an interview to Indian media that, if the DPRK's requirements are met, it can negotiate for placing a moratorium on its nuclear and missile tests, and a key requirement is that the US and the ROK should suspend their large-scale joint military drills with South Korea. The DPRK is willing to conduct dialogue with the US at any time without setting preconditions. Meanwhile, the US Department of State Spokesperson said the DPRK knew what they needed to do in order to engage the US, that is, denuclearization. How do you comment on that? A: I have noted relevant remarks. China always maintains that the Korean nuclear issue is a security issue in essence. The settlement of the Korean Peninsula nuclear issue calls for adopting multi-pronged policies, addressing both the symptoms and root causes and accommodating the legitimate concerns of all relevant parties in a balanced approach. In recent time, China has put up the dual-track approach and the initiative of "suspension for suspension", as well as the proposal to strengthen the effort for both non-proliferation and promoting peace talks. We are pleased to see these above-mentioned approach, initiative and proposal have gained understanding and support from an increasing number of countries. The Chinese side welcomes and encourages all initiatives and proposals that are conducive to easing tensions and confrontations, enhancing communication and mutual trust, resuming the dialogue at an early date and finally resolving the Korean Peninsula nuclear issue. Q: When giving an interview on June 22, Special Adviser for Unification, Foreign and Security Affairs to the ROK President Moon Chung-in said that, the ROK need to be more flexible on the Korean nuclear issue. The DPRK is engaged in nuclear and missile tests because it feels it is threatened. The tensions can be eased if South Korea and the US scale back their joint military drills and refrain from deploying strategic weapons of the US military. What is your comment on that? A: Like I said just now, China always maintains that the Korean nuclear issue is a security issue in essence. The settlement of the Korean Peninsula nuclear issue calls for adopting multi-pronged policies, addressing both the symptoms and root causes and accommodating the legitimate concerns of all relevant parties in a balanced approach. 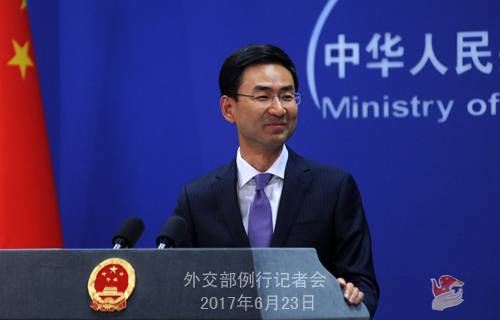 China has put up the dual-track approach and the initiative of "suspension for suspension", as well as the proposal to strengthen the effort for both non-proliferation and promoting peace talks. We are pleased to see these above-mentioned approach, initiative and proposal have gained understanding, support and response from an increasing number of countries. We have noted that, in recent time, relevant parties have sent out some positive messages. We think this is of positive significance to easing the tensions on the Korean Peninsula and seeking a final solution through dialogue and negotiation. At present, the Korean Peninsula issue faces an important window of opportunity. The international community should seize all possible opportunities, reinforce the effort to promote peace talks and jointly bring this issue back to the right track of settlement through dialogue and negotiation at an early date. Q: The ROK President Moon Jae-in said that China should do more to rein in the DPRK's nuclear program. He also called on President Xi Jinping to lift measures against ROK companies taken in response to the THADD missile system. Would China consider meeting the ROK President under this circumstance given his remarks? Do you have any comments on his remarks? A: China has always been asked "to do more" regarding the Korean nuclear issue, but I do not know what people refer to by saying "do more". 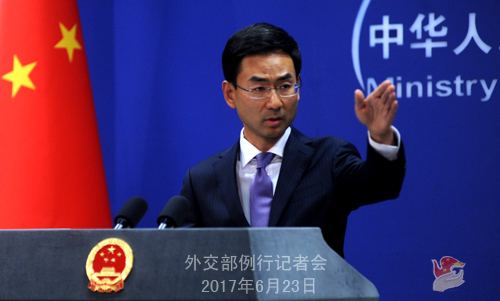 We have stated many times that China has been making unremitting efforts to resolve the Korean Peninsula nuclear issue and playing a positive and constructive role in this regard. But the crux and the key of the Korean Peninsula nuclear issue does not lie in the Chinese side. We hope all relevant parties can play their due role and take their due responsibility and jointly work to push for the proper settlement of the Korean nuclear issue at an early date. To sum up, China has been making efforts and will continue to make its efforts. Meanwhile, we also hope other parties can make efforts on their parts. On the meeting between the Chinese and ROK leaders you mentioned, this year marks the 25th anniversary of the establishment of diplomatic relations between China and the ROK. With the concerted efforts of the two sides, enormous developments have been made in the relations between the two countries and tangible benefits brought to the two peoples. The China-ROK relations stand in crucial stage at present. We hope to work with the ROK to strengthen communication, enhance mutual trust, properly resolve differences and make efforts to improve bilateral relations. On the meeting between the two countries' leaders, I have no information to release by far. Q: Indian Prime Minister Modi will meet US President Trump on 26 June. There are several issues that will come up in their meeting. The Press Secretary of the US said that among the Indian and US cooperation, the Indo-Pacific region will come up, which also includes the South China Sea. Can you comment on that? A: We have stated many times that with the concerted efforts of China and ASEAN countries, the situation in the South China Sea is easing and cooling down. We hope relevant countries, especially non-regional countries, should respect the efforts by regional countries and play a positive and constructive role in upholding peace and stability in the South China Sea. Q: Many foreign journalists based in China are wondering if President Xi Jinping will go to Hong Kong for the 20th anniversary of the handover of Hong Kong. Can you confirm it ? In fact, I answered a similar question the day before yesterday. Hong Kong is China's Special Administrative Region, and this is not a diplomatic question.